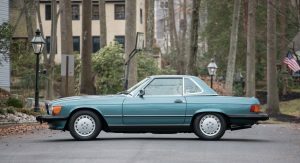 The Mercedes-Benz SL was one of the brand’s best-selling cars in the late 1980s, and with a 5.5-liter V8 engine powering the 560 model, this was the range-topping variant. 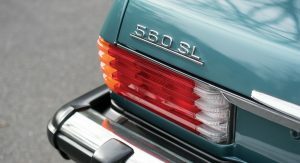 With 227 horsepower, the 560 SL took about 6.5 seconds to sprint from naught to sixty miles per hour (0-96km/h). 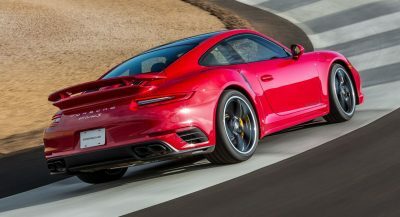 It was capable of reaching a top speed of 130mph (209km/h), so it was faster than its predecessor, despite being heavier. However, the extra bump in power required a few changes beneath the sheet metal. 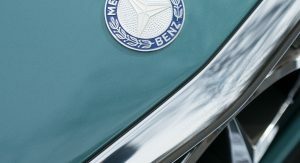 As a result, Mercedes-Benz engineers helped it cope with the added output by fitting a limited-slip differential and tweaking its rear suspension. 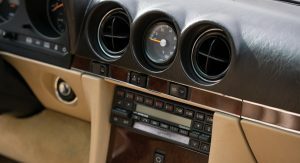 Both of these upgrades were added for the 1986MY. 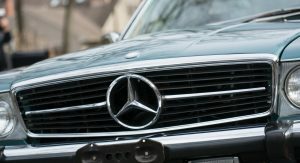 Purchasing a decent SL 560 these days goes for around $50,000, or more, for a low-mileage car in good condition, and if you can bag one for $20,000 or even less. 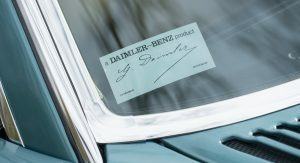 This one, though, has an estimated $70,000-$90,000 selling price, presumably because it shows just 2,950 miles (4,748km) on the clock. 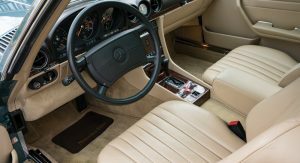 Its pristine condition is highlighted by the perfect Blue Green Metallic exterior paint and Cream Beige leather interior, which looks like new despite turning 30 this year. 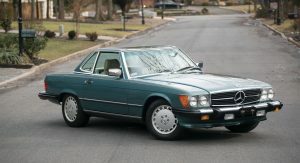 Its owner will throw in the pagoda-style removable hardtop with the car in a matching Blue Green Metallic finish. 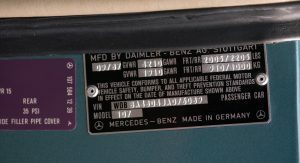 Moreover, he states that the black soft top has never been put up, except for inspection, and the seats have remained covered since 1988. 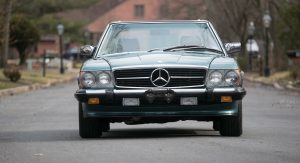 The gorgeous SL 560 is listed for the RMSothebys Amelia Island auction in Florida on March 10. These are sooooo nice. And truly over engineered so that they could be passed down for generations. Though a car like this exists to be driven. 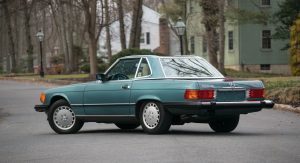 These things were very common, and there are plenty of very low mileage SL’S ( in the 50k MILE range) available for far far less than $70k. 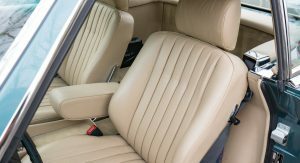 Though it would be nice to get a brand “new” classic SL that doesn’t include seats with a thousand farts of the previous owners. 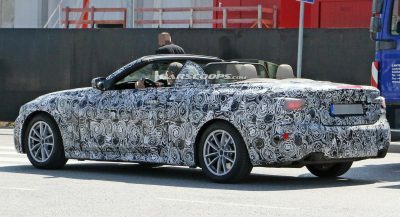 Nice car, prices will go up, but change to euro bumpers and headligths. 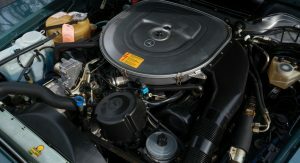 Upgrade the engine to 300+ hp. In europe it had 300 hp. Given it’s originality, such actions would make the price go down really. well it is not original it is only us spec, not how it was designed originally! When I say original I meant what it came off from the factory. 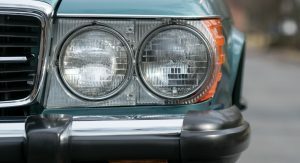 It was an US spec from the beginning and the estimate is expensive because the car is rarely driven and also original. So yeah.. like it or not, the value is higher with that uglier US spec. That is the us spec original but if you tack it back to original spec in total it migth not affect it negativily. Well not sure if you aware of how classic car markets work. For some cars, originality is high priority. 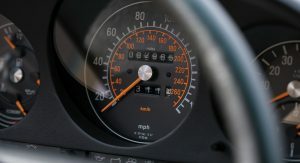 Yes you can get a regular mileage R107 and convert it to euro spec and it didn’t affect the value. 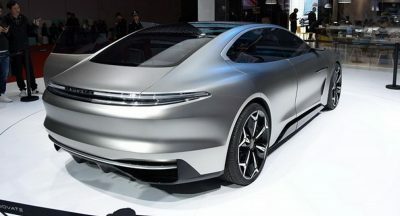 In fact in market like Germany, an US import can be make more worthed by converting it to Euro spec. But this car has low mileage and originality, and the price is high because of it, And if you take away the reason why the car has its value. Well let’s just say you won’t recoup your investment. It’s like few years ago when someone paid over $20k for the oldest mini restoration project. Like if you restore it, the car will lose it’s value and become regular mini. If you don’t the value will stay but you can’t drive it and well the Mini get even more rotten. Classic Cars world are weird indeed. 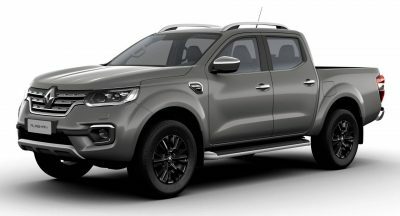 Well I am quit sure how the market works and it could be so or it could not be so because this is a special case as it’s orginality from the factory ain’t the us spec but the euro spec, but mostly you wan’t it to be beutiful because you are not only a speculator for money! Huh? Look at the auction page, the car is sold new in US, so it was build as US spec from the first place. 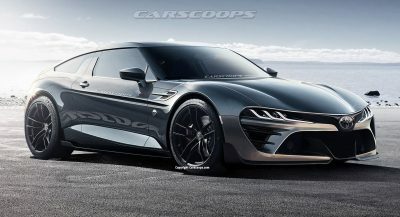 The thing is, even if the car US spec, if it’s originally comes from factory in that spec. It means the original spec is that one. You don’t seem to follow! You seems to lost on what I was saying! It’s okay classic car dealing is extremely confusing. No not me but you lost it or don’t want to understand what I said! 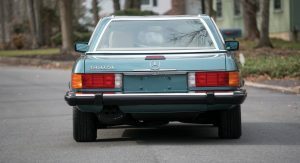 I love R107, They might not be as sporty as their predecessor, but they are a good grand tourer. I would LOVE to own that! Wonderful color combination. 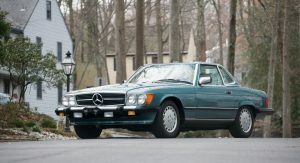 My dad was going to buy his wife a 1983 380SL. I drove it from the dealership to their home. [Which was about an hour away] It was very nice. But not very ‘peppy’. 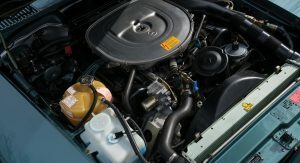 It’s 3.8 litre V8 only made 155 hp. Sadly she died just a few month later so he cancelled the order.